Something went wrong. Did you mean to visit my portfolio of design work? Or maybe go to the oil filter company? If not, best of luck. 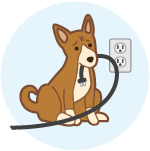 Please enjoy my plug-pulling pooch, the star of an error modal I made for Constant Contact.